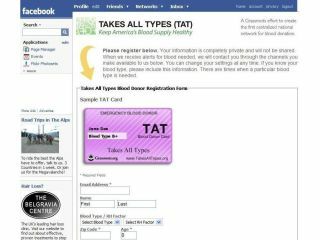 An initiative in the US aimed at increasing blood transfusion stocks now allows Facebook to register their blood type and willingness to give blood. The scheme is the brainchild of Takes All Types (TAT), a non-profit organisation dedicated to creating the first national network for blood donation in the US. According to TAT there is plenty of blood and plenty of willing donators – the main problem is communication. By harnessing the power of social networking TAT hopes to overcome this and raise national stocks. By installing a dedicated TAT Facebook app, specifying their blood type and how often they are willing to donate participants in the scheme will then automatically be alerted by their local blood donation centre when blood is needed. Even those people who don’t know their blood type can sign up by clicking the ‘I don’t know’ option. TAT will then steer such people in the right direction to find out. So far the scheme is only available to US residents, although if it proves successful we wouldn’t be surprised to see similar schemes start up in other countries.